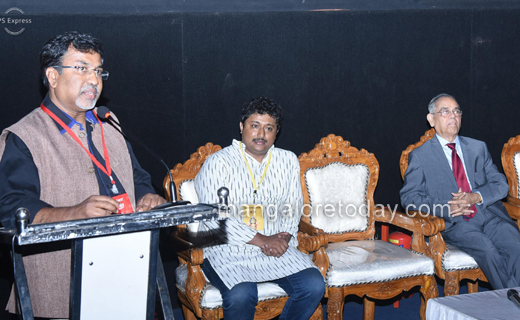 Mangaluru, Apr 08, 2019: National Award winning director P Sheshadri inaugurated the third edition of Nitte International Film Festival at Bharath Cinemas here on April 8, Monday. In his address, Sheshadri appreciated the efforts put in by the organisers in conducting the event. Pointing out that only five to six are good films from among the over 250 movies brought out every year, he said good films will have a positive impact on the audience. He also recalled that his debut movie Munnudi was shot in the city. Sheshadri also had a word of praise for Mangalureans when he said they always encourage good movies. Pro-Chancellor of Nitte( Deemed-to-be University Dr Shantharam Shetty was present as a chief guest. Raviraj, Convenor of the Film Festival was present among others. Over 70 movies of different languages will be screened during the Festival. Mookajjiya Kanasugalu was screened on the inaugural day. Various other movies including Paddayi (Tulu), October (Hindi), Tumbbad (Hindi), Redu (Marathi), Dithee (Marathi), Sarkari Hiriya Prathamika Shale - Kasargod (Kannada), Abyakto (Bengali) will be staged on different days of the Fest. An interactive session with the film makers have been arranged after screening of the film.